TS SA2 Time Table 2018-2019 Summative Assessment exam dates : Board of School Education Department has scheduled to conduct SA2 examinations for the academic year 2017-18. 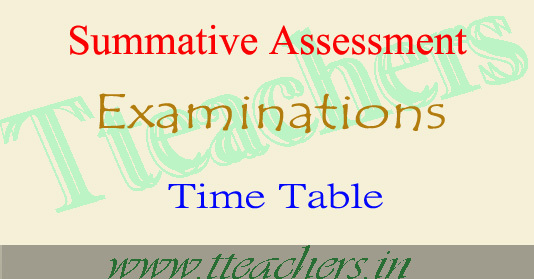 Summative-2 Examination will be stared from 2nd April 2018. For this regard earlier Director of School Education of Telangana has been issued proceeding. Earlier days Director of School Education of Telangana has released academic calendar 2017-18 As per the new academic calendar 2017-18, the conduct of two Summative Assessments in an academic year 2018 along with other instructions pertaining to vacation, training's, School Complex Meetings etc. Accordingly, the academic calendar was developed and provided to all schools along with dates for the conduct for Formative and Summative Assessments. The Telangana State Directorate of School Education is also known as TSDSE will publish SA 2 Time Table for Private and Regular Students. All the Students are needs to visit the this tteachers.in website in order to download Telangana SA 2 Exam Time Table 2018 Summative Assessment exam dates.